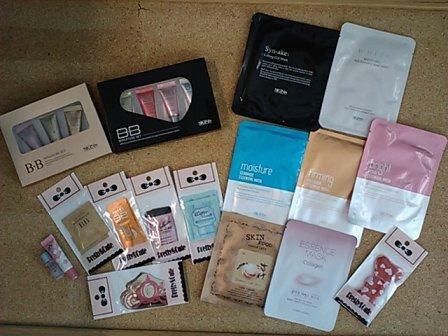 Skin79 Bright Pearl Essential Mask was part of my Pretty and Cute haul from last week. 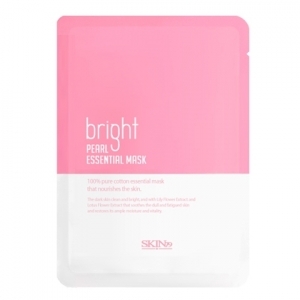 I tried this mask on Sunday night, after cleaning and exfoliating my face. I tried to get a photo of the package, but it was so reflective, and my lighting was so dim, that I couldn't get a good one. The mask comes out of the pouch very wet, and to me it smells of apricot. I thought it was a pleasant scent, although at first it was a little heady. it fit my face well for the most part. I could have used a touch more room for my eyes, but that could be solved by snipping a little slit in the eye hole next time. Also, the nose piece is a bit small for me, as well as the mouth area. Overall, these were made to fit a more petite face, but the fit issues weren't great enough to make me feel disappointed, just slightly giant-like, and it made me laugh. You leave the mask on your face for 10-15 minutes. I think I left it on there for 16 minutes while I watched TV. There was no sensation to my skin other than cold wetness. After the 16 minutes, I removed the mask and massaged my skin to work in the fluid left on my face, as the directions instruct. It didn't soak in (there is a lot of moisture left there), so I just smoothed it out and let it dry. Once dry, it felt filmy and sticky. The feeling was unpleasant. I wanted to wash my face, but I didn't want to undo the process, so I left it alone. After about an hour, most (but definitely not all) of that filmy feeling went away, and my skin no longer felt sticky. I did not see immediate results. I left my face alone until morning, and in the morning I showered and rinsed my face with water only. My skin felt kind of slimy once the water hit it, much like moisturizer feels like when you get it wet after application. I gently rubbed my face with my hands to get off as much excess as I could. My face again felt filmy, but not nearly as much as it did the night before. Then I got a good look in the mirror. I felt that there was a definite difference. My skin looked much more even toned. It didn't quite look like I already put on my foundation, but very close. It was pretty impressive. Two mornings later, and the effects have worn away. 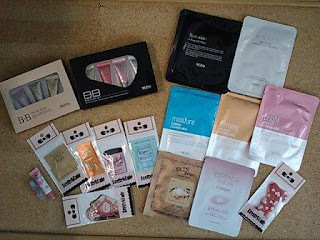 However, the performance of this mask has made me quite interested in the rest of Skin79's skincare line, and I plan to replace my current cleansers and serums with their products when I run out. If that filmy feeling wasn't there, I would give it much higher praise.